Note up front since I normally review YA: this book is not YA, it’s adult fiction. However, a reader of older YA & new adult might be interested in it. I was definitely interested in it. Historical fiction! Period piece in London! Loosely related to Jack the Ripper! Serial killer! Mystery! Scotland Yard detectives! Honestly, there was nothing about this book that didn’t interest me. This will be kind of a short review in the interest of not giving away spoilers. For the most part, I liked The Yard a lot. I felt like it accurately captured the mood of Victorian London (I mean, as far as I know…I wasn’t actually there) and there were lots of twists and turns to the story. I also liked that there were several story lines going on at once and they were all fairly intriguing. 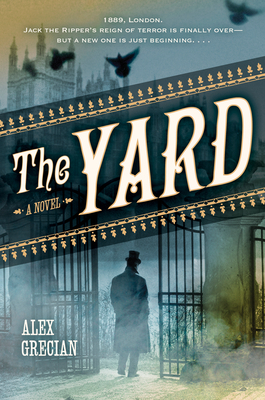 I liked seeing Scotland Yard work from the inside, and I thought that setting the story immediately post-Jack the Ripper was a pretty great move by the author. London is very uneasy and there’s a simmering resentment of police, so there are plenty of suspects when officers begin to turn up dead. I also liked seeing the early world of forensics, and throwing in real people from history is always amazing. There is some grossness/gore here and there so those who are especially sensitive should be aware of that. It’s nothing too awful, but there are some fairly vivid descriptions of murders and of dead bodies. Overall, it’s a really good read. Umm, this book is totally right up my alley. I have a weird obsession with the Ripper murders and pretty much anything set in Victorian London. I think the combination of Sherlock Holmes-esque detective work and the grisly murders is fantastic. I am definitely adding this book to my list, like, STAT! Just one question… do we actually find out who did it in the end?